I was born in January 1932 in North London and from 1933 I was brought up in Kingsbury, Middlesex just a few miles from Wembley. From November 1942 to March 1943 I was in Redhill Hospital, Edgware, Middlesex being treated for pleurisy, pneumonia and tuberculosis. After a short while recuperating at home I was then sent to convalesce at a sanatorium. To the best of my understanding, the usual sanatorium for cases at Redhill Hospital was at South Mimms in Hertfordshire but, whether because I was a child or whether wartime measures had merged hospital services I do not know, I was sent instead to Langdon Hills Sanatorium in Essex. Another thing I am not clear about is the nature of arrangements before the NHS came into being - I know that my parents paid into some kind of medical club but I don't know how this would have been run and whether it would have played any part in where I was treated. Anyway, this was a sanatorium for boys and girls which was also known as West Ham Sanatorium; most of the children there came from the East End - areas I had never really heard of before, such as Plaistow, Canning Town, Forest Gate and Stratford. Of course, I had heard of Stratford - it was where Shakespeare was born, but fortunately I kept my mouth shut long enough to learn that this was a very different Stratford. The buildings were, I think, typical of sanatoria built when rest and fresh air were the main curative treatments for TB. There was a small central admin area flanked by boys’ accommodation on one side and a mirror image girls’ area on the other. Both wards faced more or less due south and had folding glazed doors along the south giving onto a glazed verandah. These were opened as often as the weather allowed and in good spells the beds nearest to the doors were moved onto the verandah, while those behind were moved across the ward as far as possible. Most of us were supposed to be confined to bed rest for most or all of the time but I don’t remember that we were especially obedient just because we were unwell. In addition to the main wards there were several single-bedded side wards and bath and toilet facilities were placed behind the accommodation areas. The whole block, I believe, was built as a single storey. In front of the site there was an area of asphalt on which was built a schoolroom and beyond that the land rose in a slight hill at the top of which stood the Nurses’ Home. To the left of the asphalt and in clear view of the boys’ ward was an orchard - or at least some dwarf wooded area - enclosed within a wire fence. There were two fine trees along this boundary, an elm and a Lombardy poplar which had been named by one of the lads - goodness knows why - as the ‘O’Gladys’ and the ‘Straight Jane’ respectively. This threw me completely; I had never thought of giving a personal name to a tree and I asked the boy why he had done this. Alas, he seemed as unable to explain it as I was to understand it. 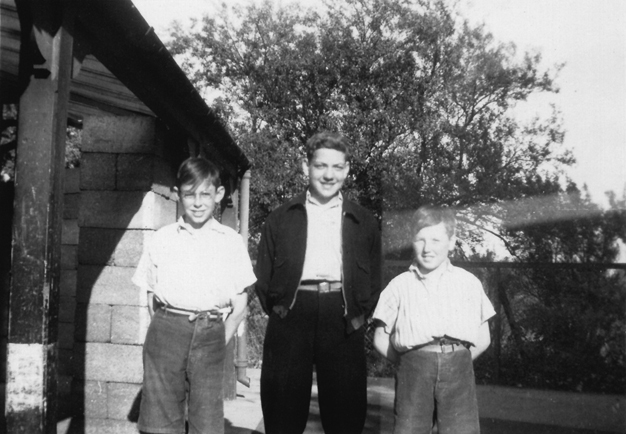 From left to right: David Alexander, Vic Bentley & Wally Dunning. Photo: © D. Alexander. Note the breeze block walling in an 'L' at the end of the verandah. This was for blast-proofing the structure and was repeated at various places along the front of the building. The picture was taken at the eastern end of the site; the orchard can be seen behind the wire fence. Beyond the asphalt was an open area of upland sloping meadow that gave onto woodland beyond. It was at the edge of the woodland that we boys built a series of ‘camps’, each of which was to be ‘the last’ and yet was inevitably replaced with its successor. I don’t remember how we did it but we managed to light camp fires in this place and ‘toasted’ wartime bread on the flames as well as making chocolate biscuits by attempting to melt some rare chocolate which we had received onto very ordinary biscuits. As I recall it, both these culinary adventures were minor disasters but we ate the results anyway. At least the toast was more successful than our winter attempts to make it by laying slices of bread, smuggled from our tea time food trays, on the hot pipes. I think that the Nurses’ Home must have been a private country house at one time. We never approached it and it stands in my mind as a double fronted white two storey building with a porch, from which we could see the nurses emerge as they came down the winding path to start their duties. The staff in charge were a Matron Noble (whom we rarely saw at close range) and Sister Holmes, who saw us quite a lot. She was a comfortable looking lady who bustled about the place, often repeating herself, whereas Matron was a slightly built slim lady who said very little. Nurses seemed to come and go - probably a result of the war - and the names have mostly gone too, but there was a Nurse Brimley and mother and daughter Nurses Wilson - the daughter had striking red hair and a temper to match, so naturally we plagued her.